Yes! Bring on the puns! +1 EXP! Oh, no… Street sharks… Someone call Kendrick now!! Haha! Man, those street sharks were so extreme that they didn’t mind destroying public infrastructure if it meant they could look cool! Swimming through concrete! RADICAL! Oh, no! Just when you thought it was safe to go back in the bathwater! Woo-hoo! 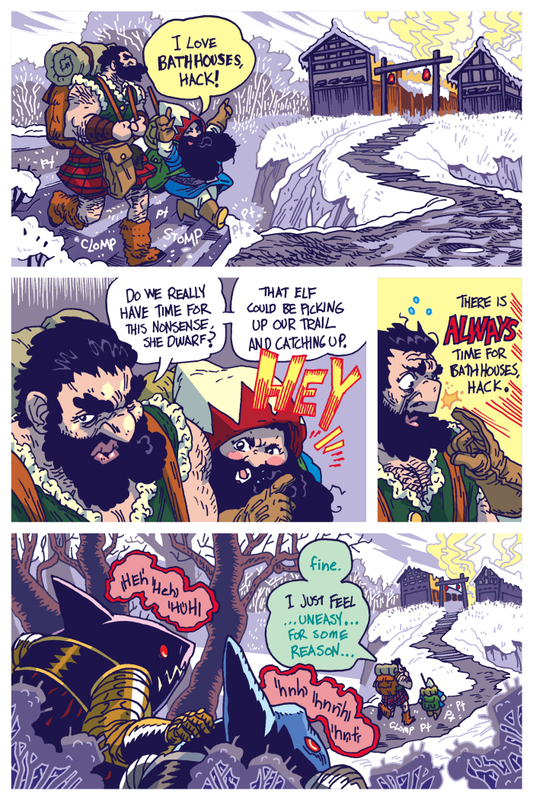 I love She-Dwarf! Great lines and colors! Excuse me, but I write a webcomic myself and though it is not part of this hosting site, may I still link to you? I love this comic and support other webcomic writers. Is it my imagination or do the landsharks talk a little like Bevus and Butthead. HAHA! I love this comment! Wait… the hood She Dwarf is wearing… Isn’t it the hood of the white mage from Final Fantasy?